My father was an only child and died before his parents, who were quite elderly at the time. I was close to my paternal grandparents, and would often ask questions about their younger years. Now my grandmother was self-conscious about her age. She was six years older than my grandfather, and no one knew her age until my father applied for a passport. Even her Social Security records show an incorrect date of birth. She would tell the census taker to “guess” at her age. I say this to give you an idea of how private they were about certain details in their lives. They both grew up in very large families with their mothers dying young. After my father past away, and as they grew older, my grandfather would spin tails about Poncho Villa and the Indians out west….especially the women. That was until my grandmother would bellow out, “shut up Joe….you’re talking silly again”. His tales got very detailed, and of course if I would ask my grandfather questions like, “were you in any wars?” and before he could open his mouth, my grandmother would shut him up again. My paternal grandfather was first generation from a Franco American family in Massachusetts. He was next to the youngest of sixteen children born to his parents, Clement and Celina, over a span of 20 years. His mother died when he was very young, and according to census records, the ages of the children changed once they were able to work in a factory or textile mill…like at ten years old. This would explain the scars on his fingers and hands as described in the second paragraph of the poster. The scars and searing on his back would indicate beatings. It’s surmised that they were either inflicted as a disciplinary measure at home, or on the job in a factory. This was typical at the turn of the century, during an era when child labor was prevalent. Joseph enlisted in the Army January 22, 1912, for three years. He deserted while serving with the 146Th Infantry from Fort H. G. Wright, N.Y., May 17, 1913. The first paragraph then details the address and next of kin at the time Private Joseph enlisted in the Army. Description: (at date of enlistment) White; born in Whitings, Mass. ; age 23 years; occupation, machinist helper; eyes, brown; hair, black; complexion, fair; height, 6 feet; weight, 160 pounds. Prominent scars and markings: Front view – scar on left thumb, left index finger, each right finger, right middle finger, each upper leg and lower left leg. Back view – sear near upper center of back, near center of back, and on left buttock. 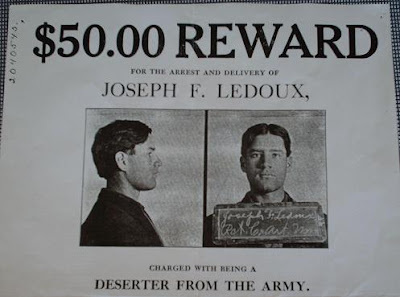 A reward of $50.00 is payable for the apprehension of this man, and for his delivery to the military authorities, until two years after the expiration of the period for which he was enlisted. The reward is payable at any United States Army post to any civil officer or other civilian who delivers the man there. If he is apprehended he should be delivered at, and the reward claimed at , the nearest Army post. The last paragraph describes the Act of Congress approved June 18, 1898 that makes desertion a criminal act. Through the same inquiries, by one of my sisters, that led to the discovery of the enlistment in the Army, desertion and REWARD, we also received additional information. Information that makes this a tad bizarre and explains the mental capacity of some of us that have genetic similarities to Joseph. And no, I won’t mention names….you know who you are. Now, I would imagine this Wanted Poster is plastered all over Joseph’s home town of Leominster, MA, and every other French enclave in New England. A whole year goes by and no one turns him in. Yes, he is in town…he’s been there the whole time. Remorseful, Private Joseph is sentenced to one year of hard labor at Ft. Leavenworth, probably on a chain gang, “breaking rocks in the hot sun”. 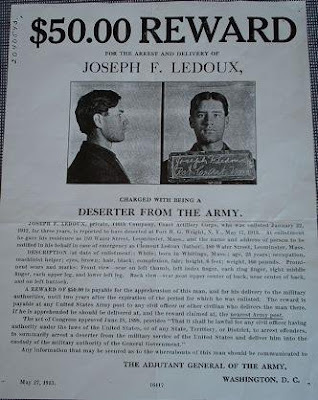 I recall he only served a portion of his sentence, (someone will correct me if I’m wrong) and when he appeared before the court, his immediate superiors requested that he be allowed back in the Army because he had been a good soldier and they needed him (the desertion rate was extremely high, close to 30% at that time). The presiding judge agreed to allow Joseph to return to the Army, but he had to use his alias. The court martial and conviction prevented his returning to the Army under his real name. The next thing we know, WWI is breaking out and our soldier Joseph deserts again! The tale basically ends there. I don’t think anyone ever received any documentation beyond that. As it was, a good portion of military records were destroyed in a fire decades ago. Even my father’s records from WWII are incomplete for that same reason. So there you have it! As a side note, this was Rita’s father-in-law, and when she found out I had framed the wanted poster, and hung it in my cubicle at work….she told me I had no shame…. 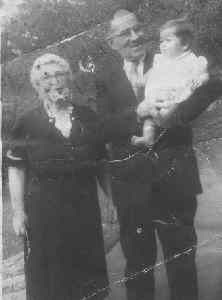 ***Me and my paternal grandparents, Joseph and Margaret. What a kick that is. Your grandfather looks very current and cute. funny how life goes in circles. My great grandfather and about 50 other soldiers refused to participate in some kind of drill with the navy around the turn of the century, and they started a big brawl. they all got thrown in the brigg. My dad said it was a story he loved telling, much to the embarrassmenht of his wife. Are you interested in geneology? 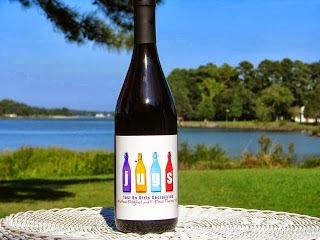 What a great story to tell at family get togethers!! Hanging that in your cubicle must have been an interesting conversation piece. I don't have any colorful ancestors. If I was a girl I'd say he's cute. But I'm not. Very interesting.....your family is kind of wacky....I can RELATE!!!! That is very cool. I love stories like that. Look at my family tree...mobsters on one side and Grandpa L on the other.....it's amazing Im here at all! BTW, no more BB spoilers please....I was watching the HOH competition tonight, and then realized that the winner has been posted on your blog for some time. Wow, 50 dollars!!! And not one of the town folk turned him over. Now that is a tight community. I laughed when you said he re-enlisted with a different name only to desert again. LOL!!! You have such amazing family members. Little did they know they would be GREAT logging material. I am a genealogy buff and I absolutely LOVE finding those skeletons. It adds color! LOVE this story! My hubby had a relative who hid in a pig sty for two weeks so he wouldn't have to fight in the Civil War! I can't imagine being THAT guarded about age.. wow, great story! I LOVED this post! You're a great story teller. My dad's family was also nutty crazy about letting people not know their ages. We once went to visit my aunt's grave and my dad and his sibs were racing each other to put their foot over the birth year on the head stone so none of us could see how old they all were. I thought it was odd then. Now with 30 years to think about it? CRAZY! I think you are hilarious : ). You were the cutest little baby. And your Great Grandfather was cute too.